Free Printable Superman Word Search. 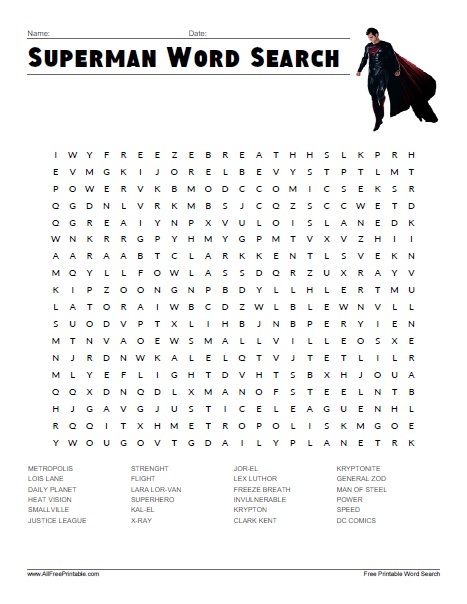 Free Printable Word Search of “Man of Steel” Superman, comics, movies and animated series. Before you see the next Batman v Superman: Dawn of Justice movie have fun finding all you favorite characters and words related to this Superhero. Share it with all the Superman or DC Comics fans, friends, and students. Find names and characters from Superman like Krypton, Lois Lane, Metropolis, Clark Kent, Lex Luthor, Smallville, Strenght, Kryptonite, Daily Planet, Kal-El, Justice League, Flight, General Zod and many more. The word search includes 24 words from the movies and the answers on page 2. Superman Word Search Puzzle is ready to print in PDF format.